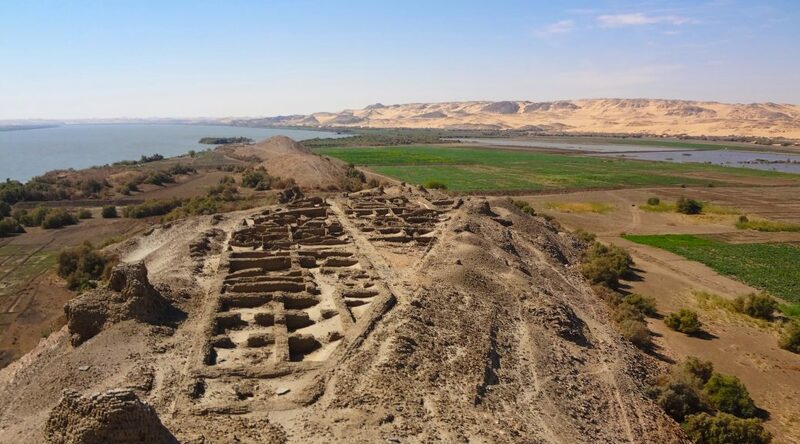 Uronarti, an island in the Nile in Lower Nubia (modern Sudan), was the site of a major fortress constructed by the kings of the Egyptian Twelfth Dynasty. An original string of more than a dozen fortresses secured the important military and trade corridor between Egypt and the growing state of Kerma to the south. They were used for over 150 years, until a weakened monarchy in Egypt was no longer able to support them. Despite their military grandeur, the forts show little sign of ever having been attacked. The threat they offered and the tight administration over people and goods moving through the area provided the control Egypt sought. Of the original fortresses, only two remain above water after the creation of the lake behind the Aswan High Dam. The area today is almost entirely unpopulated and had not seen archaeological research since the construction of the dam in the 1960s. Uronarti itself was initially dug in the late 1920s and early 1930s in a series of lightening-fast campaigns overseen by Noel Wheeler. The URAP was founded in 2012, and is a joint mission of Brown University and Swansea University, in cooperation with the National Corporation for Antiquities and Museums in Sudan. Our aim is to bring not only new questions – our views of colonialism have changed dramatically since the early 20th century – but new archaeological and technological tools to the study of this ancient place and its people. We are working to document the fortress but also to excavate the remains of human activity outside it, to better comprehend its setting in a complex physical and cultural landscape, and to illuminate the relationships between Egypt and Nubia at the edges of their worlds.